Being genuinely surprised by a movie seems increasingly rare these days as mainstream filmmaking becomes oppressively formulaic. When a film does confound expectations, and force a reconsideration of what we feel we know about a particular genre or style, it can trigger a sense of pleasure we too often forget is possible. When this involves a movie almost seventy years old which, on the surface, seems to belong to a genre as recognizable and codified as film noir, that pleasure is amplified even more. 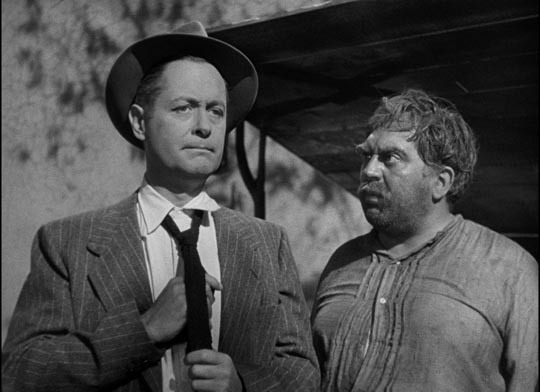 I confess that I had never heard of Robert Montgomery’s Ride the Pink Horse (1947) until Criterion announced their upcoming release a couple of months ago. Or rather, I had no memory of having heard of it, though a quick check reveals that it has a substantial entry in Alain Silver and James Ursini’s Film Noir: The Encyclopedia, which for some reason hadn’t registered when I read the book years ago. 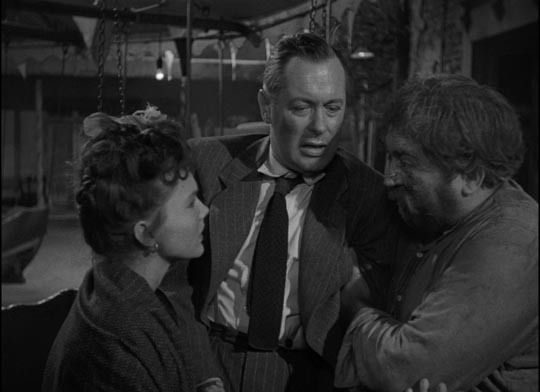 My knowledge of Montgomery’s association with noir was limited to his interesting though stilted (and ultimately unsuccessful) experiment with first-person camera in Lady in the Lake (1947), a Raymond Chandler adaptation released just six months before Ride the Pink Horse. Although his stylistic experiment in the earlier film has given it a more prominent reputation, this second directorial effort (adapted by Ben Hecht and Charles Lederer from a Dorothy B. Hughes novel) turns out to be both more interesting and more creatively successful. On its surface, Ride the Pink Horse contains many of the elements we expect from film noir: a flawed hero, a murky world of moral compromise, a femme fatale, a revenge-driven narrative … and yet (as that strangely evocative title might suggest), the ingredients don’t fall into place in familiar and expected ways. Initially, this creates an odd sense of dislocation, a slipperiness which forces active engagement in the viewer. In fact, in the early stages of the film, I was unsure whether it was showing signs of clumsy direction, an inability on Montgomery’s part to find and sustain the requisite tone that the story seemed to demand. Embittered and disillusioned ex-serviceman Gagin (Montgomery) arrives in a small New Mexico town by bus. We know immediately that he’s on some obscure mission, thanks to a superbly staged and shot sequence in the bus depot in which he hides a small piece of paper in a locker, then secretes the key with a wad of chewing gum behind the bus route map on the wall. 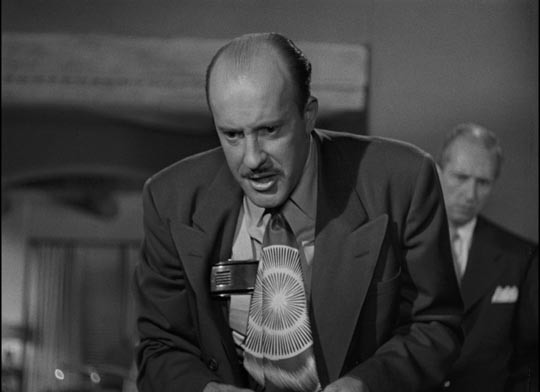 Without calling attention to technique, this entire scene is played in a single uninterrupted shot, with carefully choreographed camera movements (the film was shot by Russell Metty who, eleven years later, would create the baroque images of Orson Welles’ Touch of Evil). This is just the first of the film’s unforced visual tours de force. Gagin seeks a hotel and gets vague and unhelpful directions from the locals. Finally a strangely intense Native American girl, Pila (Wanda Hendrix), leads him. Before he heads into the lobby, she gives him some cryptic intimations of a dark fate and hands him a small talisman to ward off bad luck. Inside, he finds the hotel full and is told there are no rooms available in town because the annual Fiesta is about to start; the small town is overrun with tourists for the event. By a simple trick, he learns the room number of a man named Frank Hugo and heads upstairs; forcing his way into the room, he assaults Hugo’s hired man Jonathan (Richard Gaines) and settles down to wait. A woman named Marjorie Lundeen (Andrea King) comes in and seems unconcerned about the intruder or the unconscious Jonathan. All through these encounters, Montgomery plays Gagin with a clipped, robotic manner which borders on (and at times tips over into) a broad parody of the tough guy style of the typical noir (anti-)hero. Surrounded by full-bodied B-movie performances, the director-star seems stilted and uncomfortable. This persona shifts when Gagin makes his way to a local cantina and encounters Pancho (Thomas Gomez, who received an Oscar nomination for his performance). In this more boisterous environment, Gagin reveals good humour and a genuine sense of pleasure in what is portrayed as a looser, more genuine community. (Although there are obvious risks in assigning greater authenticity and honesty to a particular ethnic group, the film avoids many of these pitfalls thanks to the detailed and individuated performances of the Mexicans, even in the smaller roles.) Drunk, Gagin allows Pancho to lead him “home” for the night to what turns out to be a small lean-to beside a carousel (which gives the film its title). Pila shadows them, a slightly ethereal figure watching over Gagin. As the Fiesta gets underway with a parade highlighted by a giant papier mache puppet of Zozobra, a god of ill luck who is burned every year, the film offers its most striking transition with a dissolve from the puppet’s long head and flapping mouth to a close up of Hugo (Fred Clark) eating. The deliberate and pointed humour of this transition suddenly makes it clear that the slightly skewed comic tone of much of what we have so far seen is quite intentional, that Montgomery is in fact in command of the material and that the oddness is a conscious creative choice (in fact, the strange off-centre approach to what seems like conventional material resembles nothing so much as a precursor to the work of David Lynch, which has a similar disconcerting way of short-circuiting audience assumptions and expectations.) In his way, Hugo resembles one of Lynch’s villains, with his cheerful blowhard arrogance and casual violence strangely mitigated by the hefty hearing aid he wears clipped to his lapel. It turns out that Gagin has arrived in town to avenge the death of a wartime buddy who was killed by Hugo’s thugs for trying to blackmail the gangster. Gagin’s purpose is to punish Hugo by completing that blackmail plan. As he goes through the rote stages of his scheme, things are complicated by Marjorie, who claims to want in on the blackmail so she can escape Hugo’s influence, but who actually sets Gagin up. After this latter incident, Montgomery shifts from his robotic performance to a somnabulistic one. Largely unconscious from this point, he begins to repeat all the actions with which the narrative began (his arrival in town on the bus, his search for the hotel, his confrontation with Hugo), but with all sense of his purpose now gone. It’s here that, in retrospect, much of what has occurred comes into clear focus; Gagin is one of those lost survivors of the war, a man who essentially died in the Pacific but refused to lie down. He goes through the motions, but doesn’t engage. Pila’s intimations of death are as much about his prior experience as about his future. The stilted, robotic performance isn’t bad acting – at least, not bad acting on Montgomery’s part; Gagin himself is awkwardly performing the part of an avenging noir protagonist, going through the necessary narrative motions in order to fulfill the story’s requirements. That moment in the cantina when the mask vanishes and he effuses genuine warmth and humour reveals the authentic man lost behind the layers of trauma which have cut him off from the flow of life. Ultimately, Ride the Pink Horse is not a typical film noir about romantic doom; it’s a story of redemption. Gagin, who “died” during the war must now pass through death itself in order to be reborn, nursed through the process by Pila and Pancho. In the film’s final moments, he seems like a new-born, fragile and tentative, but finally with the potential to re-enter life. 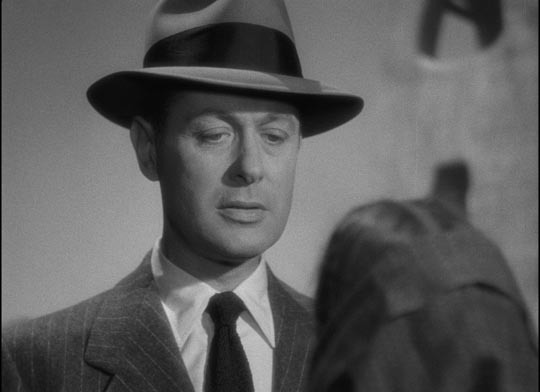 In this sense, the film is a kind of anti-noir, dressed in noir clothes. The film’s visual imagination embraces moments of shocking violence portrayed in unconventional ways. 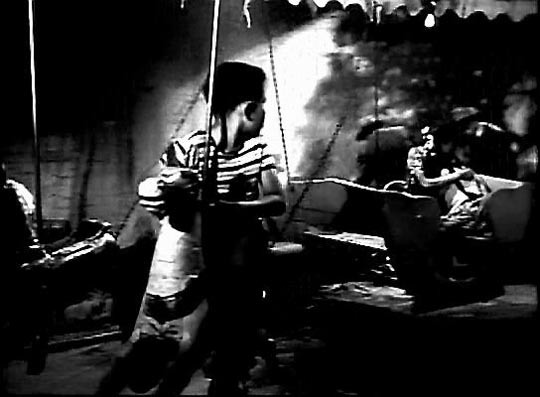 The shadowy attack in a back alley has a dreamlike ambiance which leads to the film’s most powerful sequence: with Gagin concealed in the carousel, we witness the vicious beating of Pancho by two of Hugo’s thugs from the point of view of children spinning past, becoming increasingly traumatized by what they can see but are powerless to understand or escape – a remarkable metaphor for the helplessness of innocence in a world defined by cycles of seemingly unending violence. Montgomery’s choices as an actor are original and daring and he has surrounded himself with an excellent cast which offers strong support. Wanda Hendrix as Pila has an unsettling intensity, the way she stares at Gagin suggesting that she has the power to penetrate the shield he has set between himself and life, to see the hidden, frightened self trapped inside and, because of her own isolation in the community (which views her as a freak), to help him break through and return to the world. Thomas Gomez offers a robust portrait of a man completely comfortable in his own skin, facing the world with an inner strength which is impervious to the violence inflicted on him by the corrupt representatives of a dominant society which holds him in contempt. 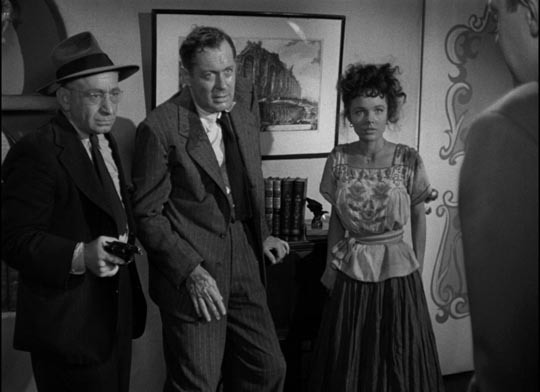 One of the least typical figures in the film is G-man Bill Retz played with great humour by Art Smith; also on the trail of Hugo, he obviously sees something in Gagin and offers friendly advice in a way which is unlike the usual relationship between noir hero and cop; wise and genially unthreatening, he represents a world of stability and order, the world which Gagin ultimately has to choose to rejoin. In effect, Retz and Pila serve as father and mother figures guiding Gagin on his journey back to life, with Pancho offering comradely support. 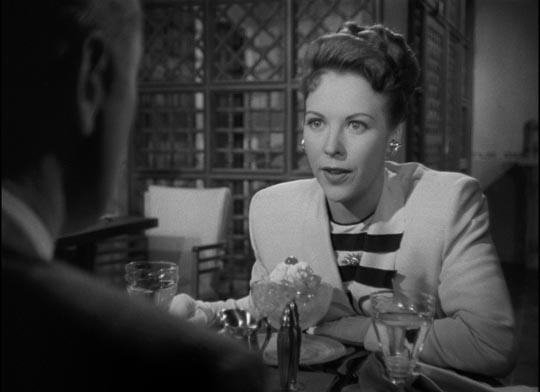 Made at the height of the noir cycle, Ride the Pink Horse has a strong parodic element; or perhaps it might be more accurate to say that the film embodies a critique of noir and its relationship to the disillusion and displacement of men who returned from the war and no longer felt themselves to be a part of society. The film works through the implications of that disillusionment and finds a way to bring its protagonist back from the brink, offering the possibility of reintegration – not by alignment with the dominant (and by implication corrupt) culture, but by identification with the oppressed and disregarded Mexicans and Native Americans, implicitly suggesting that the war and its consequences call for an opening up of the social landscape. Superbly photographed by Metty and imaginatively directed by Montgomery, Ride the Pink Horse has a unique tone, part mystical, part comic (my friend Howard Curle, who watched it with me, was reminded of Jean Cocteau’s Orphee, an apt comparison given Gagin’s virtual descent into death and eventual rebirth), which makes it remarkable that this was produced by a studio like Universal International (well, perhaps not entirely surprising as Universal was the studio which produced Touch of Evil a decade later). The film is a revelation, once again, of what surprising things could occasionally escape from the assembly line of Golden Age Hollywood and we can be grateful to Criterion for resurrecting it in this impressive Blu-ray edition. The hi-def transfer of the 1.37:1 image from a fine-grain nitrate print and duplicate negative is impressively detailed and has rich contrast and strong blacks; as we would expect from a late-’40s noir, much of the film takes place at night and there’s an expressive use of light and shadow (as well as those elaborately choreographed camera movements) which clearly prefigures Metty’s work for Welles. The mono soundtrack is fine, with clear dialogue and enough atmosphere to complement the image. Criterion provides an on-camera interview with Imogen Sara Smith, author of In Lonely Places: Film Noir Beyond the City (19:58), in which she discusses the long-running, contentious issue of just what constitutes film noir (is it a genre, a style, a state of mind?) 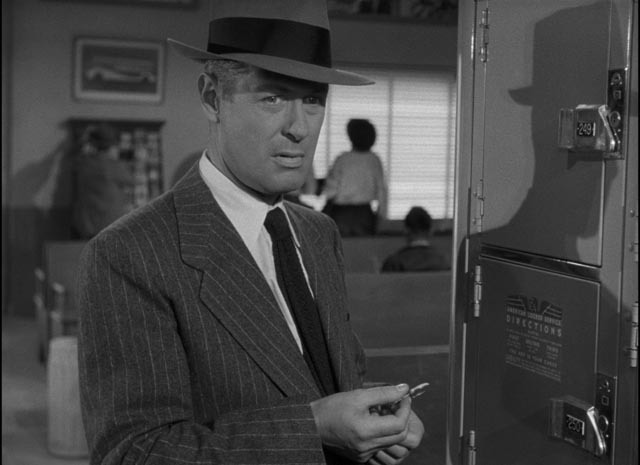 and how Montgomery’s film relates to that rich, retroactively defined cycle of post-war films we now call noir. 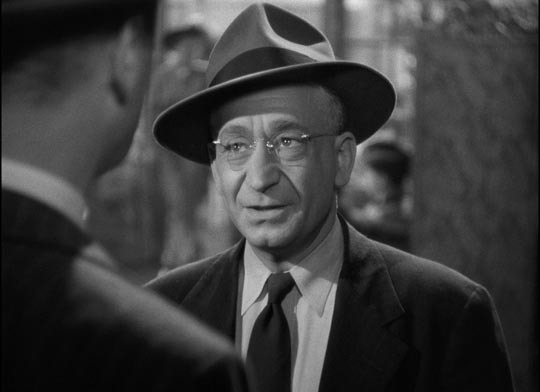 The commentary by noir experts Alain Silver and James Ursisi fills in the production background of the film and analyzes Montgomery’s stylistic choices and, again, the connections with and differences from noir in general. Finally, the one-hour Lux radio adaptation from 1947 provides a faithful condensation of the narrative, but obviously lacks the additional levels of meaning evoked by the film’s visual approach. This entry was posted in Review and tagged Actors, Blu-Ray, Criterion, Directors, Film Noir. Bookmark the permalink.